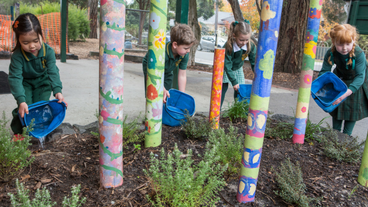 From March to June, schools and kindergartens in Boroondara can request a voucher for 50 indigenous (locally native) plant tubes for planting on school grounds. The vouchers can be redeemed at Victorian Indigenous Nursery Co-operative or Greenlink Nursery in Box Hill. To request a voucher, email Environment. These free, practical resources can help you plan habitat gardening projects. They are a resource for students to learn about local biodiversity and threats to local flora and fauna. See Backyard Biodiversity project for more information. You can order classroom sets (10) of 'swap cards' featuring images and stories about local flora and fauna, and copies of our A2 poster featuring local wildlife and plants. To request copies, email Environment. Burke Road South Wetlands, Glen Iris.